An analogy is arguably the strongest form of coaching cue. A good analogy links the unknown to something already known, making it easier for the learner to navigate a new or developing movement. Below are 10 of my favourite athletics coaching analogies. I once asked the class of school children if anyone knew the race starter’s first command. “Start your engines?” replied a boy of about nine years of age. “Wow!” I thought. What a great idea – relating the start of a sprint race to the start of a car race. An effective sprint acceleration away from the start line involves exploding forward with the eyes focused downward, as if all power is being directed through the top of the head. The speed, direction, force and shape of the movement can very much be related to a jet taking off from an aircraft carrier. Tell the athletes that they need to take off like a jet, “not a helicopter”. A high knee, high stepping action. Feet dorsi-flexed (pulled back towards the shins). To encourage these things, I ask the kids to imagine that they are running through shallow water. I tell them that they need to step over the water rather than drag their feet through it. I have heard other coaches use “running through tall grass” and “running through deep snow” for a similar effect. Many coaches would know how difficult it can be to teach young athletes a good hurdles trail leg action. One feature of a good trail leg action is that the knee should be brought right around to the front – with the thigh held high and parallel to the ground – before the foot is planted back onto the track. To assist with the achievement of a fully-completed trail leg action, where the knee is brought right around to the front, ask the athletes to “pop a balloon” with their trailing foot. Ask athletes to “pop a balloon” with their trailing foot. Tell the athletes to imagine that there is a “big red balloon” on the track just beyond the hurdle where you want their trailing foot to land. In order to pop the balloon, they need to bring their trailing foot over the hurdle, around to the front and above the balloon, before bringing their foot down directly on top of the balloon to pop it. This can be practised during drills, then transferred to the full hurdling movement. You may need to curb the tendency of some athletes to inevitably want to “stamp” on the balloon and bring the trailing foot down too hard, but once learnt, the simple command of “balloon”, even when used during a full hurdling action, can be an excellent cue. One day, when coaching the basics of shot put to a class of seven year-olds, I held up a plastic training shot to demonstrate the grip. I sat the shot on the base of my fingers, three fingers behind the shot, little finger and thumb to either side. “It looks like an ice cream in a cone!” one of the kids exclaimed. “It does look like an ice cream in a cone”, I replied, filing that analogy away for future use. 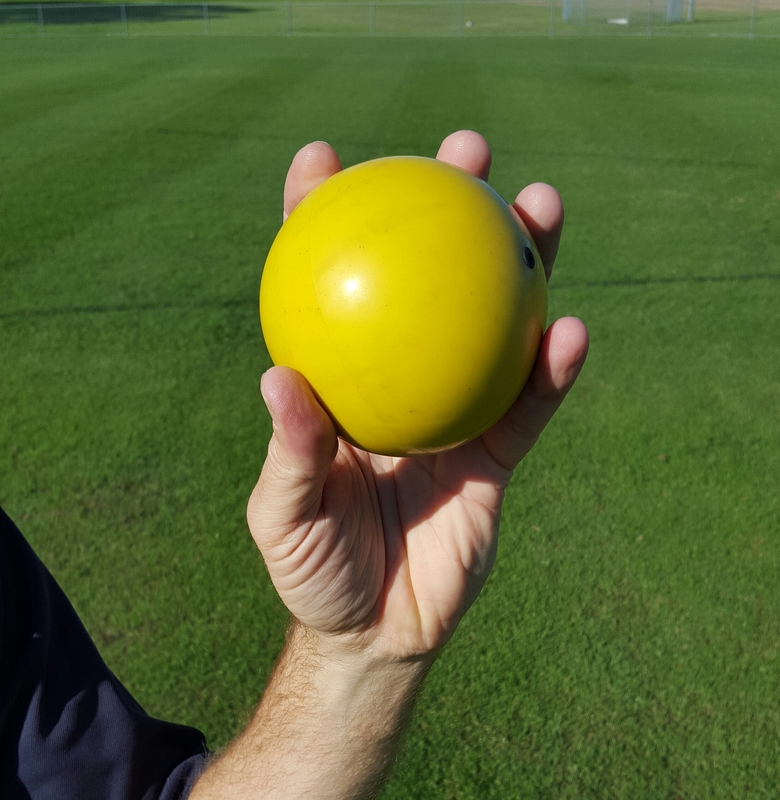 Making a “discus sandwich” is a very simple way to describe an effective starting position for a young beginner discus thrower who is using a standing throw. The “discus sandwich” describes the hand and discus position prior to the start of a throw. Whilst standing side-on to the direction of the throw, with the feet in the ready position, the discus is held up horizontally in front of the eyes (or near the mouth “ready to eat”). The throwing hand is on top of the discus, the non-throwing hand underneath the discus to provide support, thus making a “discus sandwich”. Make a discus sandwich and get ready to “eat it”. 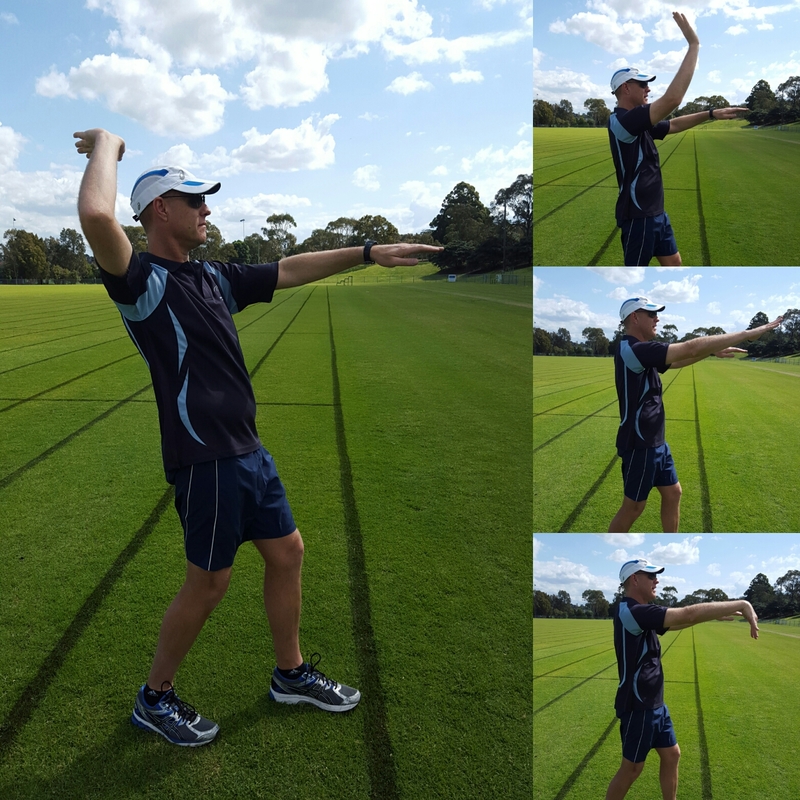 If the young throwers are being taught pre-delivery swings they can simply “unmake the sandwich” by swinging the discus back, then swing their arm forward again the “re-make the sandwich”. Novice discus throwers, not being confident of their ability to grip the discus without the aid of the bottom supporting hand, tend to rotate the top hand during the forward or backward swings so that the discus becomes vertical. This, of course, will not result in the desired flight on release. As a reminder to keep the “sandwich” horizontal, tell the throwers that they risk the ingredients of the sandwich falling on the ground if they hold the discus vertically. Once taught, the coach or teacher can simply tell the group to “Make a sandwich” as the group prepares to throw. Do you remember Daniel LaRusso (Ralph Macchio) learning to “paint the fence” in the original Karate Kid movie? If you don’t, or never saw it, check it out sometime. The “coach” – Daniel’s teacher and karate master – Mr Miyagi – used “painting the fence”, “sanding the floor” and polishing the car (otherwise known as the classic “wax on, wax off”) to ingrain basic karate blocking skills into his skeptical and increasingly impatient protege, who at the time thought he was simply doing chores. “Paint the fence” was aimed at teaching Daniel an upper and lower blocking technique. You can try something similar yourself. Pretending your fingers are the bristles of a paintbrush, drag them vertically up and down an imaginary fence post in front of you, allowing your wrist to fully flex at the top of the motion and fully extend at the bottom, and you have basically got it. Paint the roof to mimic the over-the-shoulder javelin delivery action. I took this idea and now use it to teach young athletes how to perform the overarm throwing action required when launching a javelin. I use the coaching cue “paint the roof”, which was inspired by Mr Miyagi’s “paint the fence”. 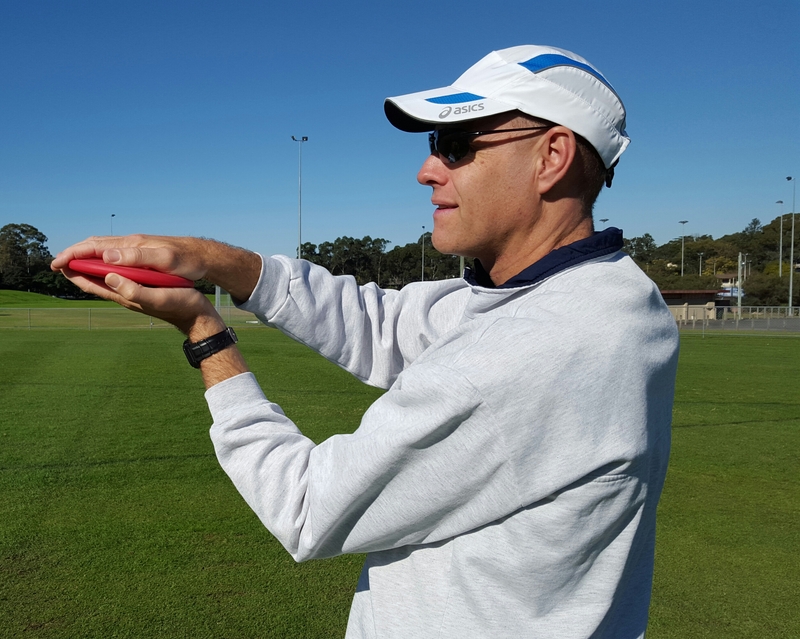 This drill can be used with young athletes to initially familiarise and then ingrain some of the basic technique points required of an effective, safe and legal overarm javelin delivery action. Analogy 7: “Paint the roof”. Jump to “swing on a trapeze”. I asked the group how many of them had either been to a circus or seen one on TV. A number of hands were raised and a few nods were given. I then asked how many of them had seen the acrobats swing on the trapeze. Again a number of hands went up along with a few nods. I told the kids that the next time they jumped, I wanted them to pretend that there was a trapeze hanging above the sand pit. Their job was to run in, jump up to grab the” trapeze” and swing on it before landing in the pit. The results were immediate. The kids began leaping higher with their arms outstretched, eyes raised and bodies upright. Not only this, but many held this position well into the flight phase as they “swung on the trapeze”. 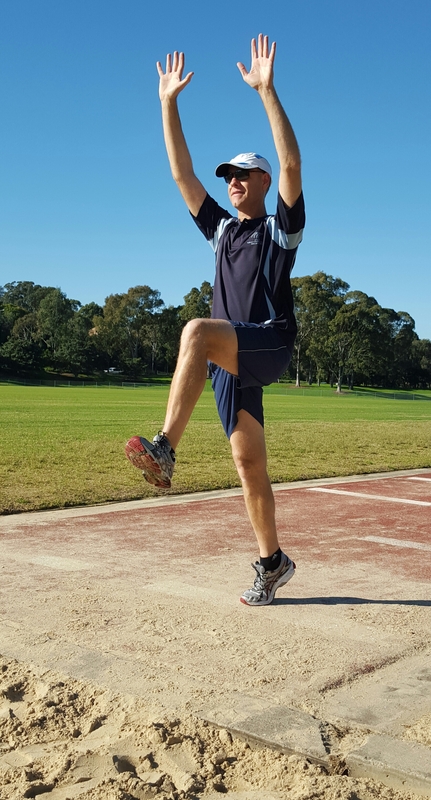 Asking young athletes to “swing on a trapeze” as they long jump has become an ongoing and highly successful part of my long jump coaching repertoire. An athlete takes off for a “flop” high jump while running on a curved path toward the bar. To fully capitalise on the curved run-up and the forces that it generates, the athlete must lean away from the bar throughout the curve and up to the point of take-off. The curve and the lean go hand-in-hand. To help young athletes learn this concept, tell them to “bank like an aircraft”. TIP: When rehearsing the lean and curve of the run-up minus the take-off and jump, it can help to have the kids carry a broomstick or similar across their shoulders and behind their head to mimic the “dipping of the wings” and emphasise the lean. In race walking, the heel of the leading foot should contact the ground with the toes pulled back towards the shin. This ensures a longer, more powerful stride. An extra few centimetres can be gained on each stride if this is done well. An effective cue to help young athletes achieve the required dorsi-flexed (“toes up”) foot position is to tell them to push their toe to the top of their shoe or to “toes up like you are trying to push them through the top of your shoe”. Try using some of these analogies, adapting them, or make up your own. Be alert to how the kids you coach describe things, Some of your best ideas will come from them. I would love to hear some of your favourite coaching analogies. I would also love to hear if you create some of your own. Let me know by leaving a comment/reply or by using the contact details below.